Disney has their hands in a bit of everything these days, including health care. * We discovered this back in April when our daughter was diagnosed with Type 1 Diabetes. *If Disney ran health care, we might not be having the debates we are having today. Disney treated Katie wonderfully when we went to Disneyland this summer after her diagnosis. We are VERY grateful. 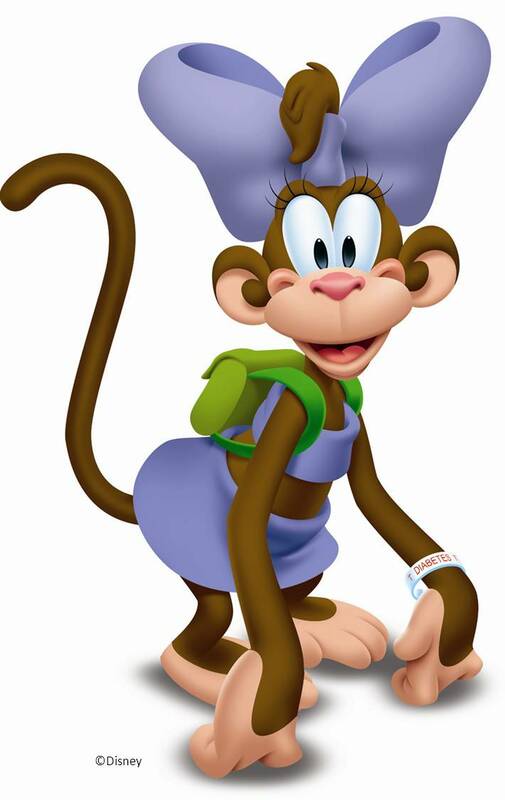 They even have a diabetic character, Coco the Diabetic Monkey…which I find ridiculous and supportive all at once. During one of our visits to the endocrinologist, one of the nurses asked if we would like a Diabetes cookbook for kids.They are a new product from Disney, in cooperation with the drug company Lilly. The nurse did ask us if we would ACTUALLY use it, and once we assured her that we do cook, she gave us a free copy! 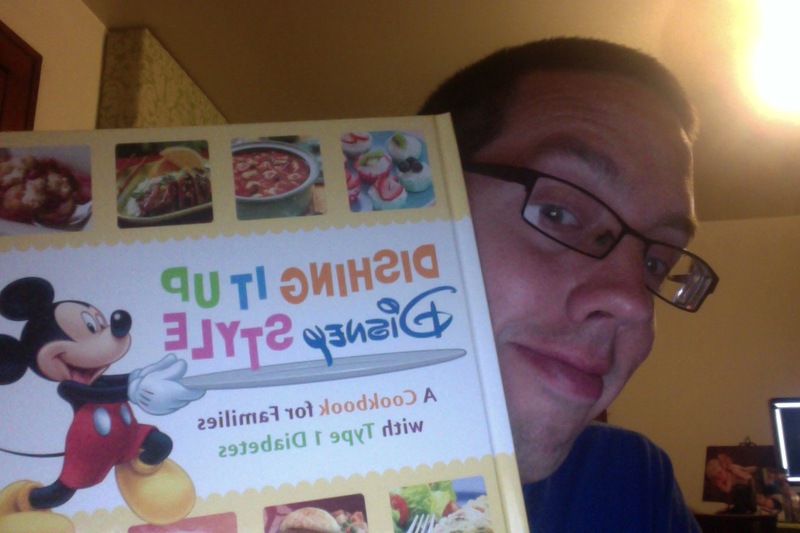 Dishing it up Disney Style is a handy cookbook full of recipes for the diabetic in the family. Each recipe shows the all important carbs, calories, fiber, and other important info for each dish. And to be quite honest, the recipes that we’ve tried so far have been WONDERFUL! For the kids, each dish is “inspired” by a Disney character. This is what I find humorous about the cookbook. You have Alice’s Chicken Salad Tea Sandwiches, Lady and the Tramp’s Cartwheels with Tomato Sauce, Mulan’s Egg Fried Rice, and Tiana’s Shrimp Gumbo. These all make sense. Then we have the Disney character dishes that don’t really fit, or in some cases are mildly alarming. Let’s start with Ariel’s Turkey Pilaf. I just know, that under the sea, merpeople just craved some juicy turkey. I’m sure when King Triton was hungry, she dutifully brought her dad a plate of fresh sea turkey and rice. Next we have Genie’s Guacamole Potato Salad…I honestly do want to try this one, but two points: First, I can picture the Genie making hummus, not guacamole. Second, if he’s a genie, is the cooking really necessary? Dumbo’s Corn Chowder: Baby elephants LOVE soup! I am concerned about allowing an elephant-A BABY ELEPHANT-to cook. Pumba’s Black Bean Salsa: Salsa’s all the rage on the African savannah. And finally, most concerning is Donald’s Chicken Fajitas. For some reason Bird making bird is mildly disturbing. I can picture Donald feeling conflicted while cooking this dish. Anyway, the dish I have made most often is Mowgli’s Moroccan Chicken Kebabs. As a Geography teacher, I find this dish perplexing and possibly harmful to the American student. Namely, Mowgli is from The Jungle Book, which is set in India. Morocco is nowhere near India. Also, I don’t see Mowgli making Kebabs (He seems to be the most unsanitary Disney character in the book). But I digress. NOTICE THE DISTANCE BETWEEN MOROCCO AND INDIA!!! When we make the recipe at home, we do make some modifications. Namely, we use pork tenderloin rather than chicken, as I am allergic. Also, I have been making it on the grill pan for the sake of convenience. Regardless, it is a DELICIOUS dish, and you should give it a try! I like an onion and a cup of grape tomatoes, but you could use your imagination here. 1. Assemble the dry rub in a bowl. Stir to combine. 2. Cut the meat into one-inch cubes. 3. Place cubed meat in a large bowl. Sprinkle over dry rub. Cover thoroughly with your hands. 4. Cut up one onion into one inch wedges. Place with a cup of grape tomatoes in another bowl. 5. Add a half tablespoon of oil to onions and tomatoes and toss to coat. 7. TURN ON THE FAN ABOVE THE STOVE…there will be smoke. 8. Place meat on grill pan, use tongs to turn chunks of meat after about two minutes. Continue turning periodically. I find that the meat is done in about 8 minutes. 9. After 8 minutes, place meat on serving platter and add the tomatoes and onions. Stir frequently, and remove when tomatoes have char marks and onions are tender. 10. 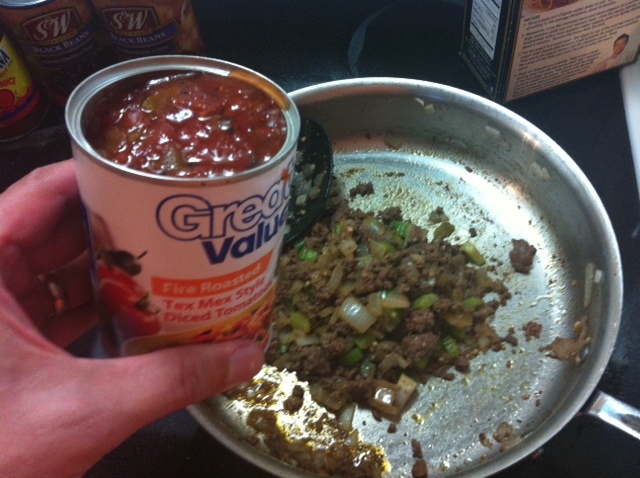 Place tomatoes and onions over the meat, serve and enjoy! 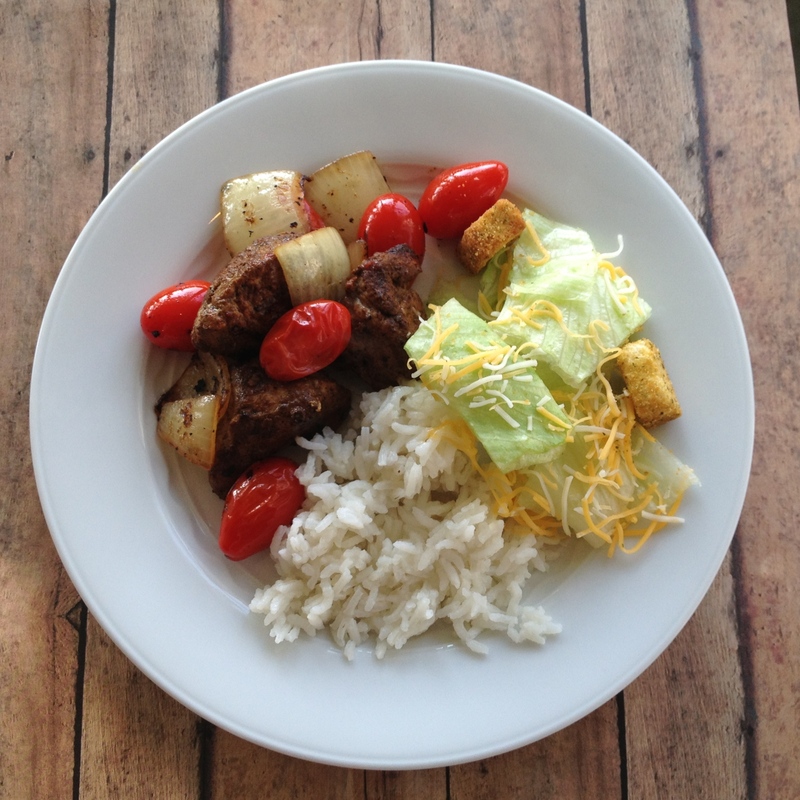 The dish is definitely flavorful, and in case you are curious, the meat contains only 4 carbs! If you like you can tone down the heat, but Mowgli may be disappointed! Finally, I’ll ask my readers, what is your favorite Disney character, and what food do you think they would like and or make? I used to live in Las Vegas. Ah Vegas, such a different time in our lives in such a different place. Out on the western edge of the Las Vegas Valley is an ENORMOUS planned community called Summerlin. My wife and I bought our first home in Summerlin back in 2001. We bought a condo right on a TPC golf course. Of course, we were part of a condo association, but we were also part of the SUMMERLIN NORTH COMMUNITY ASSOCIATION. They are the Galactic Empire of western Las Vegas. When we moved in, we were given a voluminous book larger than an annotated Bible with the rules and regulations we were expected to abide by. There used to be little code enforcement trucks prowling the neighborhood, looking for nefarious signs, and illegal gas grills. There used to be workers whose job was to literally scrub the curbs along the road. It was all very clean, very pleasant, and very Orwelllian. Everything was nice…TOO nice. Getting fined for enjoying gas grilling was a step too far! So we moved to a Las Vegas neighborhood without a homeowners association. In our new neighborhood, I found a crack pipe (is that one word or two?) in our driveway. Police helicopters with searchlights hovered over the nearby freeway at night. 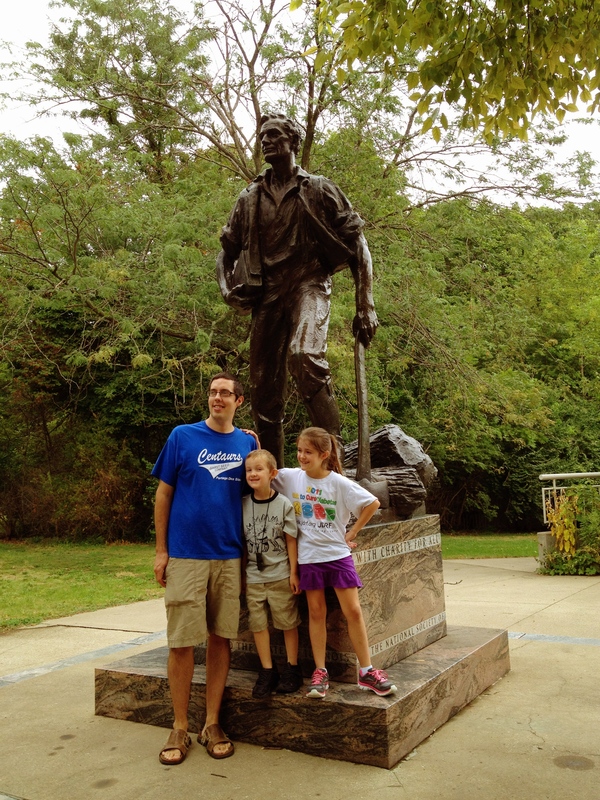 We realized soon after our daughter’s birth, that the Midwest is a fine place to raise a daughter, and moved back home to St. Louis. Why am I telling you this? Well, I was reminded of our days in Summerlin when the family visited Winghaven last week for dinner. Winghaven seems to be a fine community, but you get the feeling that it’s just a bit TOO nice. Llewellyn’s Pub is located in “downtown” Winghaven, and we spent a pleasant evening on their outdoor patio, safely gated from the dangers that surrounded us in Winghaven. 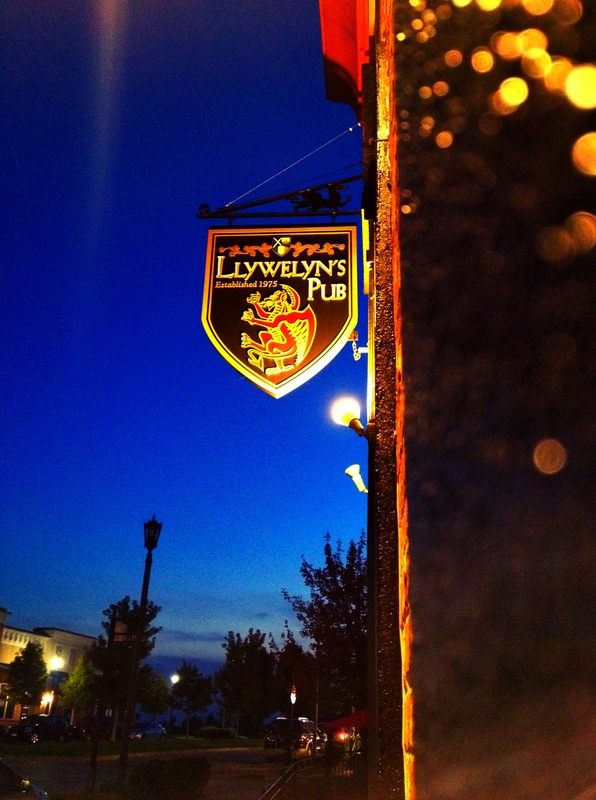 * Llewellyn’s Pub is a Welsh themed pub with several locations throughout the STL area, and I have to say, I had my best experience in their Winghaven location. *I had to chuckle at the “gang” of unruly Upper-Middle-Class-Middle Schoolers who gathered on their BMX bikes and skateboards outside the gates of Llewellyn’s patio. They loitered, they rode in vaguely threatening circles, they went home at sundown. Enough about the ambience. It was a pleasant evening, and I did enjoy a Blue Moon while waiting for all of our party to arrive. Our waitress was very nice, and put up with our lingering at a table throughout the evening, waiting for my very pregnant sister-in-law and her husband to arrive. As an appetizer, we ordered the Welsh Rarebit. 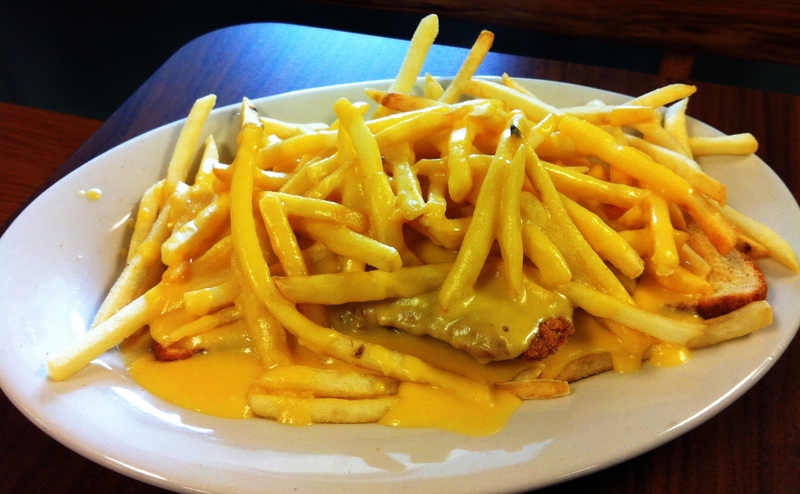 This is a cheese sauce, flavored with Guinness, traditionally served on wedges of toast. I tried to make it once a few years back, after an episode of Good Eats, and was unimpressed. However, Llewellyn’s Rarebit was savory, with a hint of Guinness, and a nice strong cheddar flavor that tasted great with the toast and beer. For dinner that evening, I ordered the bangers and mash. I have to say, I was intrigued by the lamb sausages, and thought I’d give it a shot. 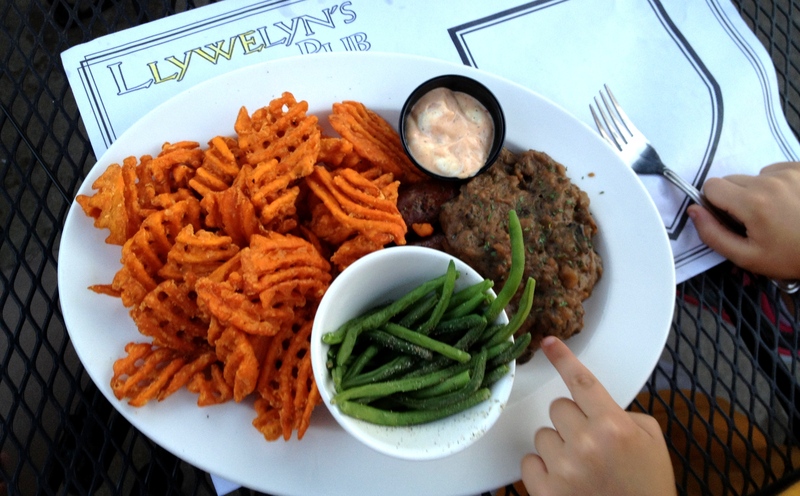 Although, I didn’t go pure Celtic, since I replaced the mashed potatoes with waffle-cut sweet potato fries. There is little I won’t do for waffle cut fries. Also, how can people not like sweet potatoes? It is a dessert vegetable. That is all. It was a wise decision for a couple of reasons. First off, Llewellyn’s lamb sausages (bangers) are SPICY! I loved the flavoring, but found the sausages themselves to be rather dry. I’m not sure if they were overcooked, or if there is just little fat content in the sausage that leads to their dry texture. However, this was OK, since they were smothered in a rich, flavorful brown sauce. I thought the sweet, salty, perfectly cooked fries were a good complement to the hot sausages. Overall, the dishes were a bit hit-or-miss. My wife had a turkey cottage pie, and although she was told there weren’t many mushrooms, there were quite a few. She was not a fan. My son had the standard kids’ pizza, and it was OK. My daughter ordered a rosemary chicken flatbread, and it was quite the hit at the table, with its chunks of chicken, olives, rosemary, and blend of cheeses. As we left that night, I realized that I found Llewellyn’s to be a great fit for Winghaven. Llewellyn’s is vaguely Celtic, with a semi-authentic pub area which sits in a fake downtown in a very pleasant (almost too pleasant) corner of the St. Louis area. If you’re there, try the Welsh Rarebit, eat the Bangers and Mash…but stay safely in the gated area, or the Winghaven Eaglets (My name for the Upper Middle Class Middle School Gang) may mildly menace your pleasant day. First off, I’d like to happily report that there was NO BLOOD in the first installment of cooking class this year. All kidding aside, things went very well. 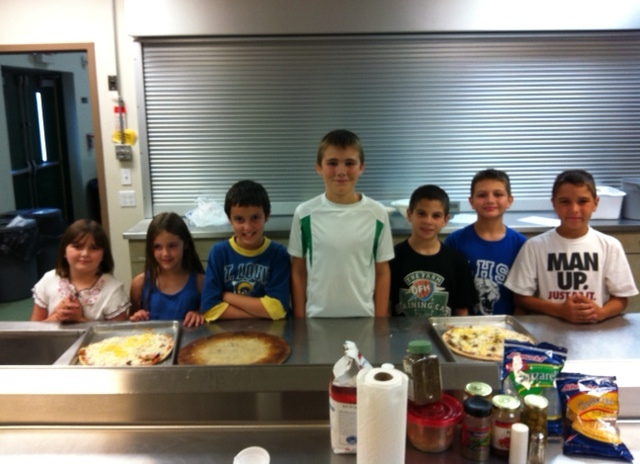 Last Friday, 13 kids gathered in our school kitchen to make pizzas. They ranged in ages 5-11, and in general, I would say they had very little cooking experience. 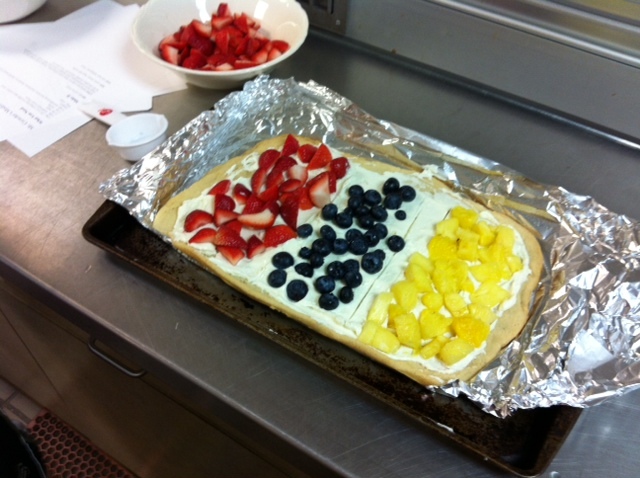 Our menu consisted of two things, pizza and fruit pizza. I reasoned that cooking is all about following directions, If you put things together in the wrong order, they won’t come out right in the end. Also, I did mention that the kitchen can be dangerous, and that safety is important! (I did not say that I don’t want to clean up blood….but that is true as well). Then, after mandatory hand-washing, we began. Before I go any further, cooking class would not have worked without the amazing assistance of my saintly mother-in-law. The biggest lesson I learned was that Mr. Crowder needs more help next time. 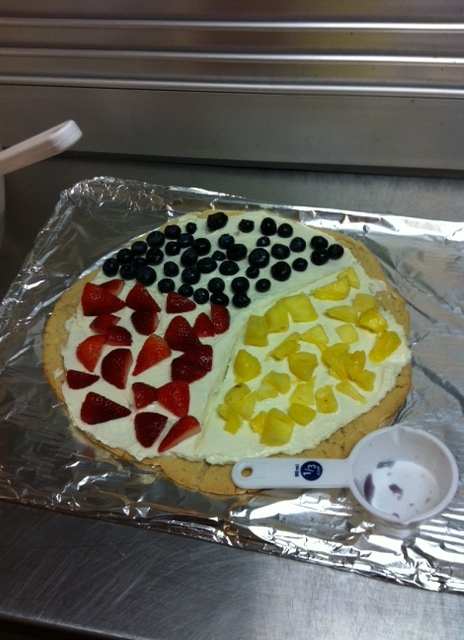 For the fruit pizzas, there were two teams: the mixing team and the cutting team. The younger students mixed cream cheese, vanilla, and sugar together to make the “sauce”. All the kindergarteners and first graders took turns mixing, and although there was some conflict over allotted stirring time, “IT’S MYYYY TUUUURRRRRRRRRRRNNNNNNNNNNNNN TO STIRRRRR”, they did wonderfully. The older kids were taught to use a knife to cut up fruit. I always find it funny that we teachers are always so vastly outnumbered by students. I’ve said before, that the kids could revolt at any time and overpower me, but fortunately, kids usually can’t organize themselves to do such things. Now I’m teaching them to use knives. Anyway, they skillfully chopped strawberries and pineapple chunks into bite size pieces. After that it was on to the regular pizzas. For this, I divided the kids into four teams. Each team was to make one pizza. I tried to divide the teams up with kids of various ages on each team. We talked a little about the history of pizza (thanks Neapolitans! ), and got to work. For this task, I gave the students a list of steps they had to follow. Overall, there were 10 steps including clean up. Each team assembled their pizzas according to instructions. I made them measure out pizza sauce and the cheeses, to give them experience with using measuring cups. I also gave kids a choice of toppings. I had pepperoni, browned hamburger, and olives available. Two of the groups just stuck with pepperoni, but the all-male group added copious hamburger and pepperoni (because they’re men! ), and my daughter made a deluxe with hamburger, olives, and pepperoni. My son had a minor meltdown when we put the toppings on before the cheese…but I somewhat calmly explained that we do that to keep the toppings from sliding off. Anyway, we topped the pizzas with mozzarella and colby-jack cheese, and then I placed them in the oven. Ten minutes later, SUCCESS! Pizzas were oozing with meaty, cheesy goodness. When the kids left at about 5:30, I was pretty wiped out. I thought things went alright, but wondered if it was worth all the effort. 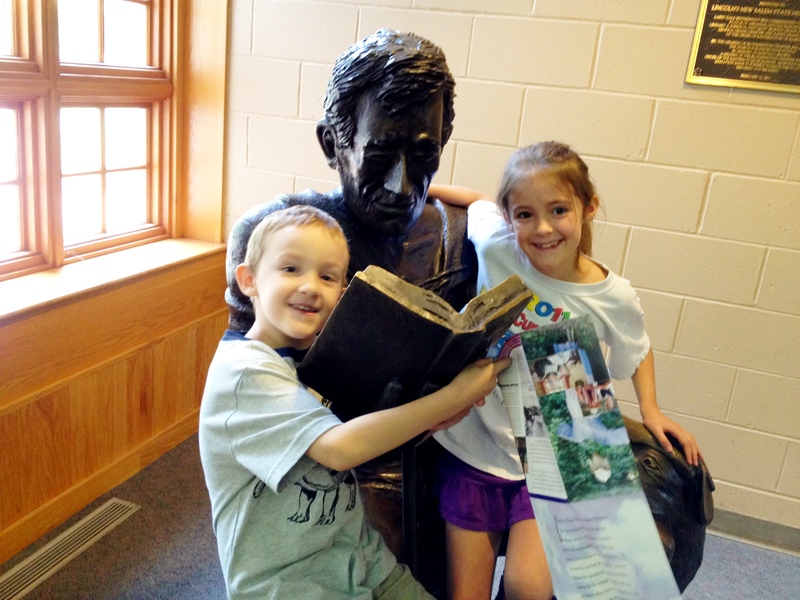 Then Sunday morning…I received sweet affirmation that the kids learned. One of my students was sitting in front of us at church. Her mom turned around and told me that her daughter loved the class and that they were making homemade pizzas that night. She even showed her mom how to hold her knife (in a non-threatening way…I hope…). Overall, her comments really made my morning, and I’m looking forward to the next class two weeks from now, when we’ll be tackling breakfast at 3:30 in the afternoon. If you are curious about our kitchen adventures, check out my semester plan in this earlier blog post. Finally, I’ll ask my readers, what do you first remember cooking as a kid? 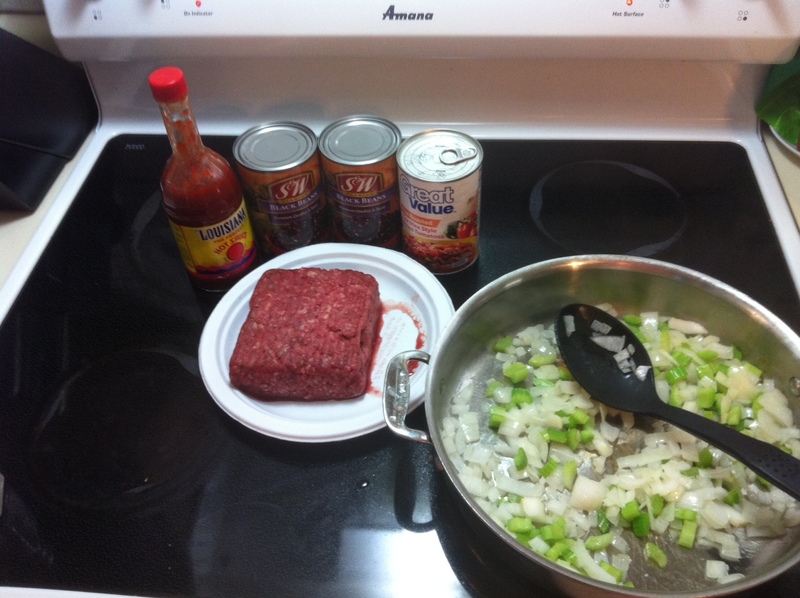 Although it was 97 degrees today here in the waning days of August, I felt like making chili tonight. There are many things I love about chili, but I think one of the things I love best about it is how forgiving of a dish it is. If you go back to the history of “true” chili, also known as chili con carne, it was definitely a meal born of necessity. The story goes that cooks along the cattle trails in the American southwest used a blend of chiles and spices in a long simmering stew to tenderize very tough strips of beef, or even other less savory creatures. Sometimes this meat was on the verge of rot, but the spices and chiles masked a rather unpleasant flavor. Additionally, these cooks often were using raw, un-aged beef, which we would NEVER do today. So, from its very beginnings, chili was a savior for the busy cowpoke on the go. I am not a cowpoke. I herd children, ages 5-14. When I come home from a hard day on the trail, I want me some good vittles. So, today chili it was. *Whenever I have seen chili con carne made on TV during those chili cook-offs I find those people to be mildly insane. “THE BEEF MUST BE CUBED EXACTLY IN 7/16 INCH CUBES!” You think I’m exaggerating, but check out the 2010 chili cook off winner’s recipe. Did he really stand there with a ruler, checking those cubes? You, my measuring friend, are a dedicated man. I digress. As a solid midwesterner, I believe chili needs beans. (However, I remember some of my Wisconsinite friends thought Chili needed macaroni) So, when I got home today, I was ready to make some chili, but I was NOT sure if the proper ingredients were available. They were not…but it’s OK, because chili is a forgiving friend. What I had on hand was: Half an onion wrapped in the fridge, two older stalks of celery (there was still crunch in them), ground beef, a can of fire-roasted diced tomatoes, spices, AND…black beans. I love black bean soup, but I haven’t made black bean chili. So, a cooking adventure began. First I diced the onion and celery. I sautéd them in a little oil with a little salt to get things going. You can see my main cast of characters at this point in the process. After the onions were translucent, I added a pound of ground beef and some garlic (garlic did not make the picture cut, as cooking while taking pictures has proven to be a challenge for me). Once the meat was browned, I added my first layer of spices. I really like chili powder and cumin. I know chili powder usually has cumin in it, but I add extra for the smoky flavor it brings. I will confess, I am not a measurer. I eyeball it. Once the meat was browned, I drained it but only put half of the meat back in. Why you ask? Back when I weighed much more, I consumed large amounts of ground beef. I try to limit that now. I tried making chili once with just a half-pound of ground beef, and found that it tasted just as good, minus all the fat. I will say it again, chili is a forgiving friend. What do you do with the rest of the beef you ask? We like it as taco filling on another night. The diced celery in the beef even provides some extra crunch, and the meat is already well-spiced. Anyway, I added the fire-roasted diced tomatoes to the beef, as you can see below. I like the subtle, lingering heat the fire roasted tomatoes give to the dish. 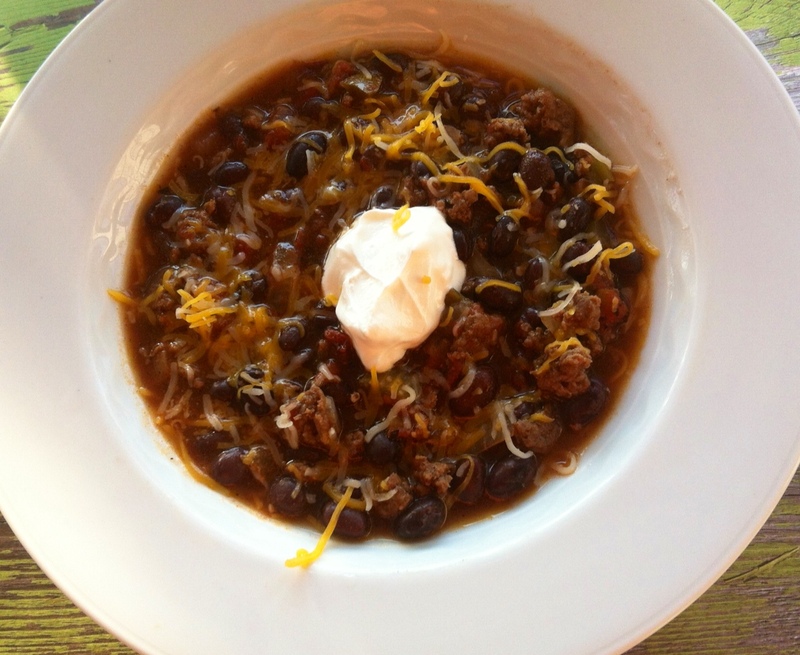 We always garnish our chili with sour cream and shredded cheese…chili plays well with others. Overall, it was great. The black beans had a different consistency than the usual chili beans, and it was seasoned well. Katie had two bowls, and Brendan ate his whole bowl, onions and all. Sarah finished up the pot when she came home from a photo shoot. So, there you have it. My non-regulation chili with spare ingredients was a hit. I believe that all chili wants is to be your mealtime friend. It will forgive your mistakes (like all the bean liquid), and treat you right at mealtime. Now, I have a challenge for my readers: I am curious about your chili recipes. How do you do this dish at your house? If you list your recipe, I will make it (to the best of my ability) and blog about it. I’m thinking of doing one of YOUR chilis a month until Christmas. But I can only do it with your help. Please send me your recipe to my email address (listed on my about page), or post it in the comments below to share! My only disclaimer is that I am allergic to POULTRY. No white chili recipes please. I will not blog from the hospital! Thanks for reading. Let the Grand Experiment Begin! One of the missions of the blog is teaching kids about food. So, with that in mind I’ve started a cooking club at school. Our first lesson is this Friday. I told the parents about this plan back at parent’s night in August, and people seemed to be excited. I let people know that I would limit each class to 12 participants, and that it wasn’t going to be one of those things where you MUST be at each meeting. So last week I let it be known in our announcements that I would have the cooking club sign up sheet on my door Friday morning. The first 12 to sign up were in. Anyone in grades K-8 could participate. Student follows me with pencil in hand ready to affirm his John Hancock to the document. By 8:15 there was mild panic as students came in. SIGN UP NOW! BEFORE IT’S TOO LATE!!! By 8:30, the 12 slots were full. Apparently, expectations are high. So, for this first class, we’re making pizza. Perhaps that explains the excitement. We will be learning to use measuring cups, do some chopping, and general food safety (washing hands, washing fruit, avoiding cross contamination). Overall, I hope it goes well. We shall see if I am capable of pulling this together. Below is the plan for cooking club for the rest of the semester. I’d like to know people’s thoughts on it. I thought I’d stick to easy things, and always try to include a fruit or vegetable with each meal. Mostly, I want kids to learn about food, and to enjoy fresh homemade food. This year we will be trying something different, in addition to our sports offerings. We will be offering a cooking club and games club. Originally, I had thought I would offer them bi-weekly, but now I think I will do one activity each semester. I would like to look into some ideas for games club, and I won’t have it ready at the beginning of the year. Cooking club will run throughout the first semester. The goal of cooking club is to learn to apply some math, reading, and even geography skills into a real life application. I also would like to encourage the kids to eat fresh, healthy and homemade food. My thoughts are that this will be open to all students, but I will limit each “class” to 12 kids at a time. To borrow a phrase, we don’t need too many cooks in the kitchen. Sign-ups will be the week before each class. Once I know how many kids have signed up for each class, I’ll buy the right amount of ingredients for that class. There will be a small fee for each class, divided equally among the kids and depending on what ingredients I needed to buy. The lovely wife and wonderful kids had an outstanding first week of school. Sarah nailed a couple of projects, Katie transitioned to third grade like a pro, and Brendan has turned out to be an attentive and compliant kindergartener. I even felt reasonably successful this week. So, with all that in mind, Sarah and I got to get away for a very brief overnight getaway at the Lake of the Ozarks with some great friends. Along the way, I got to have a new food adventure, that one would not expect in the middle of America. Before I go any further, I will say, I have always had mixed feelings about eating our mollusk friends. Clams good! Mussels: good! Scallops: Sweet and delicious! Octopus: There is a reason some call them devil fish. 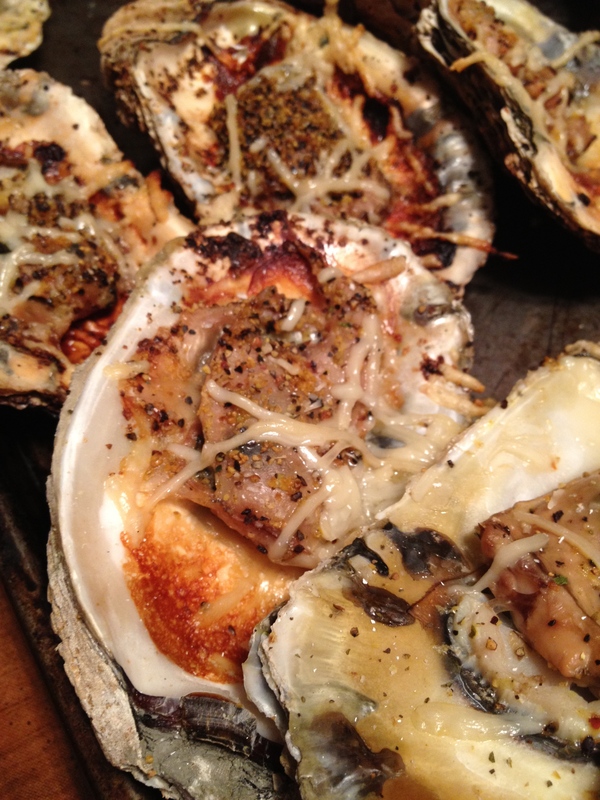 Oysters…what do I say about oysters? Well, my experience with oysters goes back to my childhood. When I was a kid, my Grandpa Crowder used to live with us for several months at a time when he was in his eighties, and I was in middle school. My grandpa was quite a character. He would smoke his pipe in bed and occasionally try to trip you with his cane. He would whip you at dominoes, gin rummy, or especially at checkers (he was almost blind, so we put white tape on black checkers so he could see the board). Then after he beat you, he’d laugh. He was fun to have around. But, one of my clearest memories of him was oyster stew. It was SO bad, that once when he sat down for his lunch of it, my mom, sister, and I all put clothespins on our noses while he ate. He laughed and laughed. So, my first impression of oysters was not good. Basically, my fantastic mother-in-law puts heats cream, tons of butter, and then adds some shucked oysters (not from a can). Then they put OYSTER CRACKERS in and drink the creamy, buttery broth. Occasionally someone may get an oyster speck, but that’s it. In 2002, Sarah’s Aunt Pat (from Wisconsin, also known as “America’s Oysterland”) made stew at a big family reunion. She used different, smaller oysters…I tried some in the stew, and it was great! So now, I was confused. Could these lowly bottom feeders be good? So, back to this weekend’s adventure. We were down at the Lake of the Ozarks (Known worldwide as the place for fantastic oysters) and one of our friends brought some VERY FRESH seafood on ice. This friend of ours works for a very wealthy individual. Occasionally he provides our friend with some AMAZING seafood. A few weeks ago, he brought home some big eye tuna. 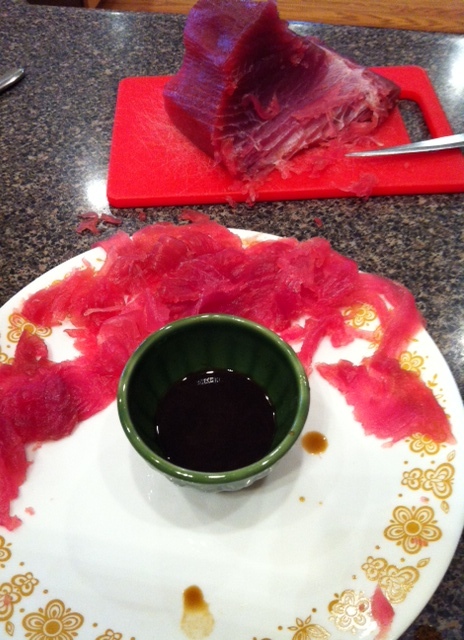 We had it sashimi style, and it was delicious. This weekend, our friend brought fresh oysters and two ten pound lobsters. 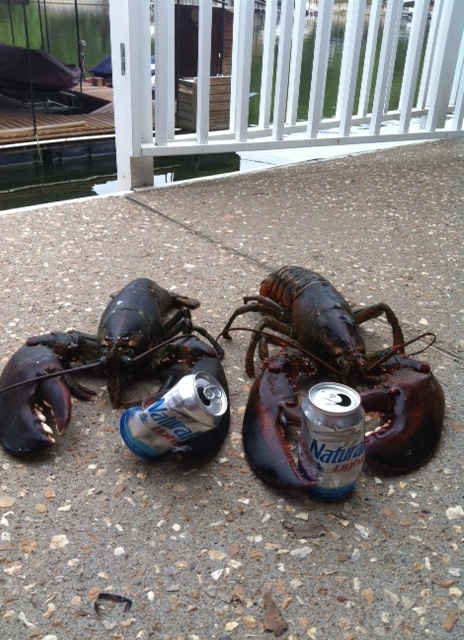 Unfortunately, we didn’t get to stay for the lobster, but I will let you know, the lobsters had a good time before their date with the steamer. Perhaps they wouldn’t have gotten so overweight if they didn’t drink so much. Back to the oysters…we had 50 fresh oysters on ice for Friday night. Most of them were put on the grill to cook in their shells with a little garlic, spices, and parmesan cheese. But a couple were left aside for those who liked them raw. After seeing one of our friends take one off the half shell, I thought I’d give it a try. SEE VIDEO POST FOR THRILLING OYSTER EATING FOOTAGE!!! I put all my preconceived notions about oysters aside, added a little Tobasco sauce, and let that little bivalve slip-slide down my throat. It was cold, salty with a touch of spice, and actually wonderful. I especially loved getting the liquid out at the end. I could honestly see myself eating a whole tray of those in the future. These were delectable. We put a little lemon juice on each one, and had one amazing bite of what I’ll call Ozark Oysters. The parmesan and oysters complimented each well, and I thought the lemon really brightened each bite with it’s slight sweet-sour flavors. So, what have we learned? I’ve learned that I have seen my relationship with oysters come full circle, from clothespins on the nose, to sucking down these live bottom-feeders in central Missouri on a fantastic weekend of food with friends. So, I’ll ask my readers two questions. 1. How do you feel about oysters? 2. What is your favorite mollusk meal? The last days of summer are a melancholy time, especially for a teacher. Every year we are offered a taste of the retired life. Late mornings, the flexibility of schedule, time to yourself, not having to answer hundreds of questions in a day, and not having to wear the shackles of society (shoes). You know it is going to be about 10 months until you get that freedom again. I know other people don’t have this luxury that teachers have, but every year there is a mixed bag of excitement and worry; hope and sadness. But you know who had it worse?? Your problems are put in perspective and you have a greater respect for the man. Anyway, I strongly suggest people check out the Abraham Lincoln Presidential Library and Museum in Springfield. That’s what we did this last Monday, as part of a Last Day of Summer adventure with my parents, the lovely wife, and wonderful children. Now just up the road from Springfield is the New Salem State Historical Site. We toured the site on Monday morning. While there, we were given a recommendation for lunch at Gillmore’s Cafe just up the road in Petersburg, Illinois. The family hopped into the van and made the short ride up to the Cafe. It’s not much to look at from the outside, I think it was an old garage. However, if you are looking for a down-home meal at a ridiculously low price*, you have found the place. *BLTs with fries for around $4. Same with the burgers. 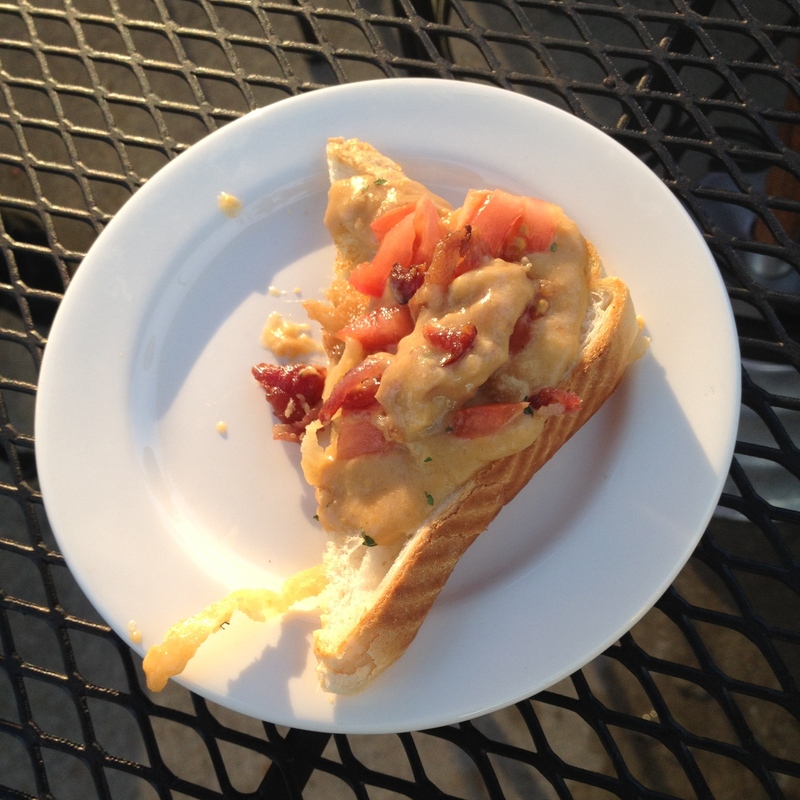 The server was friendly, and half of the group ordered BLTs (check out my earlier musings on this topic). I however, ordered a Breaded Tenderloin Horse*…I’d never heard of this before and I thought I’d give it a try. It was described to me as a breaded pork tenderloin sandwich with cheese sauce. *You really probably shouldn’t put “Tenderloin” and “Horse” together on an American menu…people might get the wrong idea. It was pork. Not horse. Breaded pork! Cheese! Sign me up! Overall, it was ok. However, my lovely wife recommended that I not eat all of it. After all, it was a pile of pork, white bread, fries and cheese. The pork tenderloin was really good. It was moist and, well, tender. The cheese sauce was oddly grainy. Overall, I’m not sure why it’s called a Horse. Frankly, if you ate this every day, a horse would be unable to support your massive bulk. I only ate half. Hooray for my healthy choices! Oh wait, I ordered homemade pie. I promise I will write a future blog extolling the virtues of pie. Now, the Tenderloin Horse was so-so. Everyone else enjoyed their BLTs and patty melts. However, we all agreed that the pies were AMAZING. I would go back for the pie. I ordered chocolate-cream pie. I think we have gotten used to the Jell-O pudding mix pie, or the very whipped chocolate mousse style store-bought pie. Those are all ok. This was pie perfection. The picture doesn’t do justice to how good it was. The chocolate had a full-rich flavor. Almost a dark chocolate. There was sweetness, but it didn’t overpower the chocolate flavor. I also like the fact that it didn’t have three inches of cream on top. The cream was a great compliment with its velvety-smooth texture to counteract the thick chocolate layer. Finally, the crust was firm and flaky, and held together throughout the pie. I like a crust that doesn’t fall apart, but doesn’t overpower the rest of the ingredients. 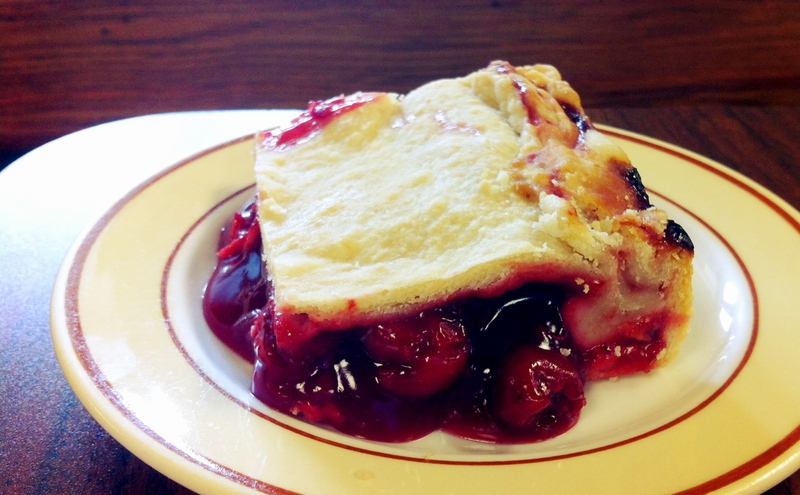 Just an FYI, Sarah ordered the cherry cobbler, and said it was good as well. You’ll have to take her word for it, because in my opinion, cherries are the fruit of the devil. So, if you ever find yourself in Lincoln Land, and have a hankering for home cookin’, go on up to Petersburg and check out Gillmore’s Cafe. 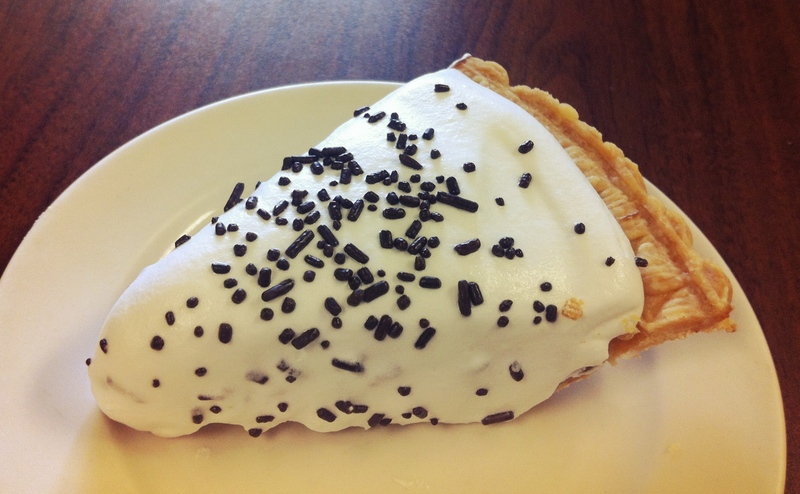 If you steer clear of the Breaded Tenderloin Horse (Once again, not a real horse), you can have two pieces of pie. Overall, nice people, good sandwiches, and GREAT PIE. So, I’ll leave my readers with a question. Where is your favorite spot for down-home cooking in the Bi-State area (or even farther)? Let me know! 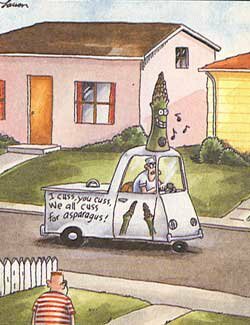 I cuss, you cuss, we all cuss for asparagus. Over the last few years, asparagus has become one of my favorite vegetables. I planted it in my garden this year in hopes of having home-grown asparagus in the years to come. Good things come to those who wait, and in this case, the wait will be two years before we get a really good crop. Anyway, I decided to share ten thoughts about this young sprout of a vegetable that shoots out of the ground and into our hearts. I have become the laziest asparagus cook in the world. I wash a handful of stalks, cut off the bottoms, and set them in a microwavable dish with a small splash of water. Then I unceremoniously put it in the microwave for four minutes until they are still a little crunchy. I put butter and lemon on top. Delicious! I’ve tried pan-frying them with oil and garlic, roasted on the grill, and carefully steaming them. However, this lazy way gets me to asparagussy goodness asap. Don’t judge. I eat them with my fingers. Is that wrong? I saw something about asparagus manners somewhere that said it’s ok. In my opinion, they are the French fries of the green veggie world. Buttery, unique green veggie fries. My daughter eats them that way too. 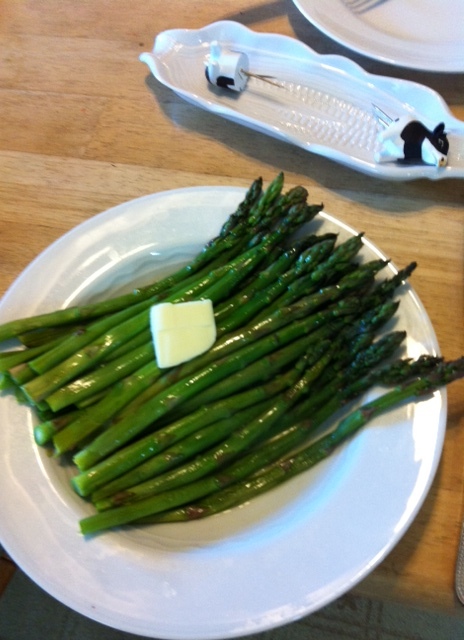 Speaking of the wonderful daughter, one stalk of asparagus is one gram of carbohydrates. For the parents of a diabetic, that is super convenient! Thanks asparagus for being user friendly! Asparagus is from the lilly family…lilies are my favorite flowers…coincidence? In full grown asparagus, the berries they produce are poisonous. Which always leads me to wonder, how did people first discover what was OK to eat, and what was not? For example, tapioca comes from cassava roots. You cannot eat the cassava leaves or stems. They contain cyanide! How did someone first discover these things? Karl dies. Bob learns valuable culinary lesson. I have never tried white asparagus. Have any of you? Seems like a cruel trick to a plant. Hey, you’re reaching for the sun! Good for you! NOW I COVER YOU IN DIRT TO TAKE AWAY YOUR CLOROPHYL!! I THINK YOU TASTE BETTER!! Of course, asparagus is famous for its lingering odor several hours after consumption. You know what I mean. I think it is a testament to its goodness that people put up with that. By the way, weren’t the first people who tried asparagus even MILDLY concerned with these urinary consequences? I would have sought my local ancient health care professional. Finally, one of my all time favorite Far Side Cartoons is below…I miss that comic. So, with all that in mind, how do you feel about asparagus? Do you like it? Any cooking methods or recipes to share? Etiquette? What about white asparagus? Let me know your thoughts in the comments below. The lovely wife and I were out scouting out locations for St. Louis Ocarina and doing some shopping for Victorian era dresses. 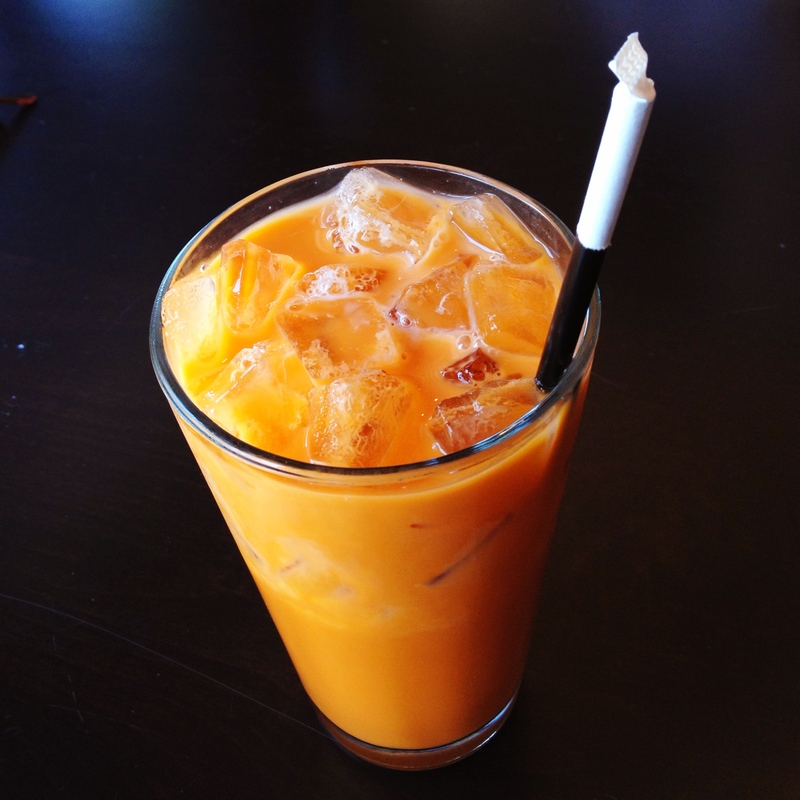 Normally that sort of thing wouldn’t be my cup of tea, but for Thai iced tea I would do most anything. I hadn’t had Thai for quite a while, and had never been to King and I. But the prospect of Thai iced tea on a perfect summer’s day lured us in to this slice of Thailand amidst the Vietnamese restaurants along South Grand. If you check out their website, you will notice that they have recently remodeled the café, and are still working on the main dining room. The café has been decorated in a minimalist, modern design, with black tables and chairs. Although it seemed a little sterile, the background music and cool lighting made for a comfortable feel after a frustrating morning. Linda, our server, was prompt and cheerful with our drinks, and taking our order. While taking my order, she asked the most mystifying question at any Thai restaurant, “How spicy would you like it?” I have always found this to be a roll of the dice at any new Thai place. A little background on that. First off, I do enjoy spicy foods. I also enjoy the different ways capsaicin is delivered in different foods. Punchy Cajun spice, that slow, lingering heat of Indian food, the burst of spice and cilantro in Mexican. However, in Thai food it can be a knockout blow to your mouth and enjoyment of your meal, or a pleasing heat to be dulled by coconut milk and sticky rice. 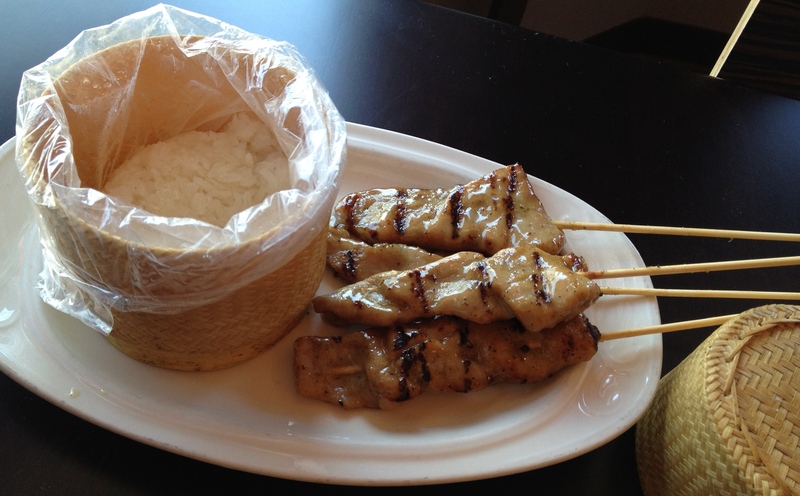 I still remember the first time I tried Thai food. I liked Indian and thought I’d branch out. I ordered some Pad Thai “Hot”, and was able to get through the meal with some sweat, but really enjoyed it. That gave me false confidence for my second foray into Thai. The wise learn from their mistakes. I chose medium heat in my green curry with pork, while Sarah chose sweet glazed pork skewers with sticky rice. During the short wait for our lunches to arrive, I enjoyed the Thai iced tea. It was very well mixed, with ample sweetened condensed milk, and that background hint of coconut. Most places pour the coconut milk or condensed milk on top of the tea, but King and I apparently blends the tea and milk together. I really enjoyed the consistency of flavor. Our lunches arrived, we were very satisfied. 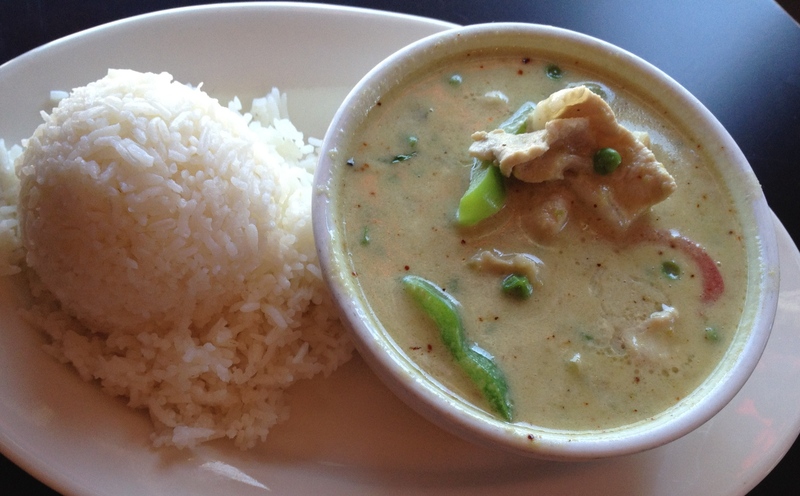 The green curry had thin slices of delectable pork, draped in a broth of green curry and coconut milk. The flavor was enhanced with crisp bell peppers, green peas that still popped, and large fresh basil leaves. The heat was truly as advertised, medium. I found it to be a little mild for my taste, and actually added a miniature ladle* of the chili paste that came as a condiment. Taking a spoonful of rice to dip into the broth with some pork, pepper, and peas was a perfect flavor combination. The rice and sweet-spicy broth complimented each other very well. *I would love to have a set of miniature cooking utensils. Made by elves. I also enjoyed a bite of one of Sarah’s pork skewers. They looked very appetizing with evenly spaced grill marks and a glistening glaze on top. The juicy pork got an added jolt of flavor from the tangy, sweet glaze. We quickly went through our meal, and Linda returned to check on us, and later promptly took care of our bill. As I left, the last sips of Thai iced tea cooled my palate as we walked out on a glorious summer afternoon full of mansions and Victorian era dresses. Check out King and I! Thai it, you’ll like it! …ooohh…couldn’t resist. Finally, what are your local Thai favorites? Let me know! As I mentioned in an earlier post, we are lucky to live in a place where people sell their home grown produce during the summer. Of all the summer treats our family looks forward to, the one we probably most enjoy is Heitmann Corn. 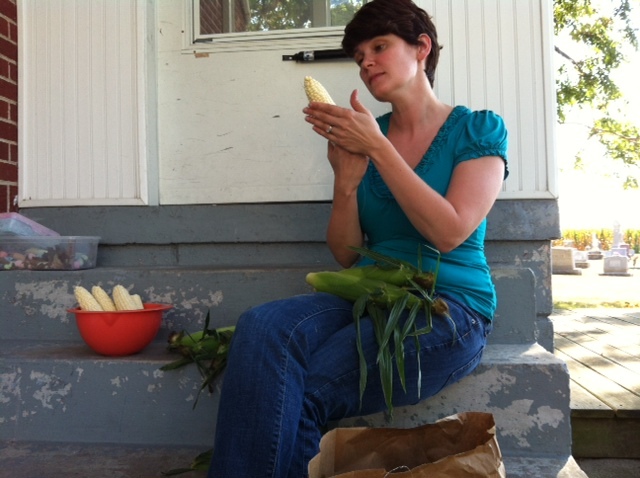 The Heitmann family goes to our church, and they grow a fairly large amount of sweet corn on their family farm that they put up for sale each summer. Giant ears with massive kernels that are bursting with the sweetest corn juice (is that the term?) we have ever had. So, on Monday, I went out to the Heitmann’s farm to grab a dozen ears for dinner that night. Just thought I’d pass along a few pics to share the experience. A nondescript sign lets you know what’s available…notice the sign doesn’t say “World’s Best Corn.” No need to gloat when you are the best. You pull up the driveway, and there is a storage shed where you pick your ears. 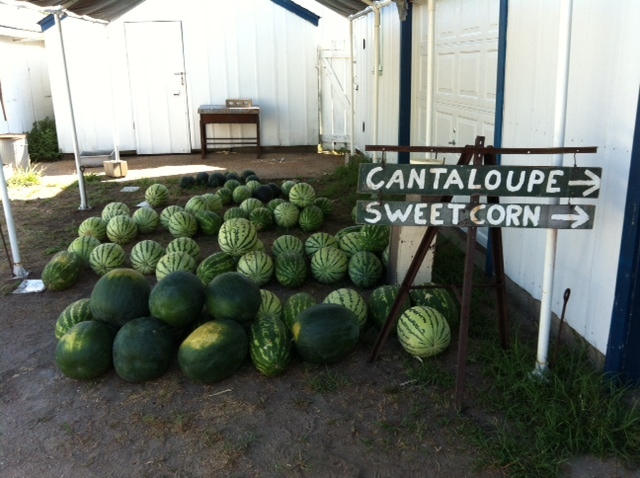 Also, the Heitmanns sell watermelons and cantaloupe. More on the watermelons later. 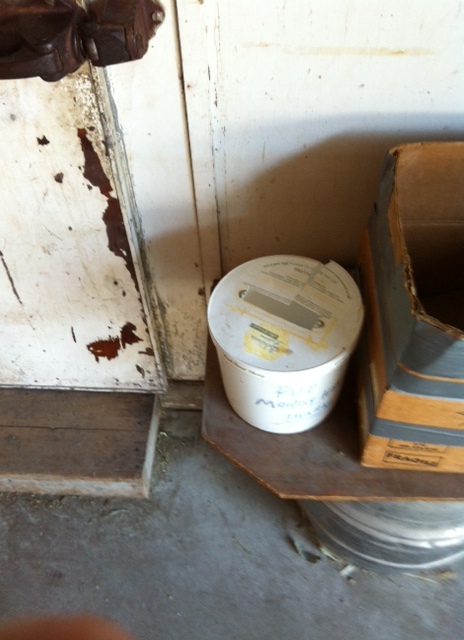 Inside the shed, there is a refrigerated locker, you will find burlap sacks filled with summertime treasure. Once you’re done, you can pay in the bucket ($4.00 per dozen), or if Gladys is home, you can give the money to her. 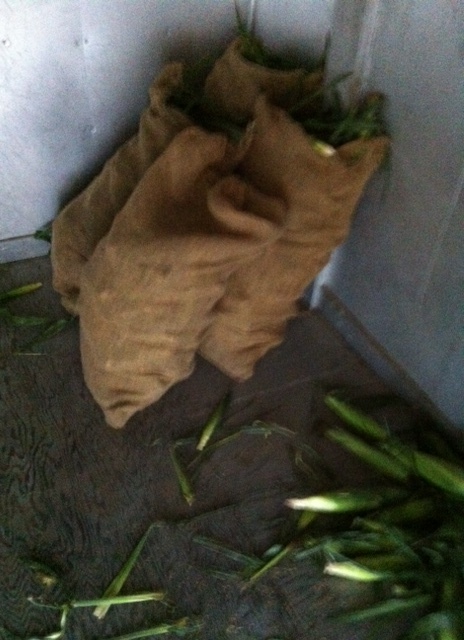 So, that day I picked up a dozen ears of corn and a watermelon. 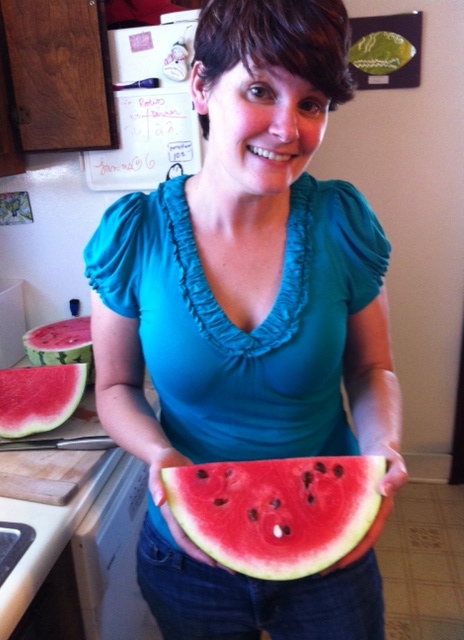 I bought a pretty large watermelon for $2! If you’ve seen watermelon in the grocery stores lately, that is a bargain…and it is SOOO much better than a store-bought melon. 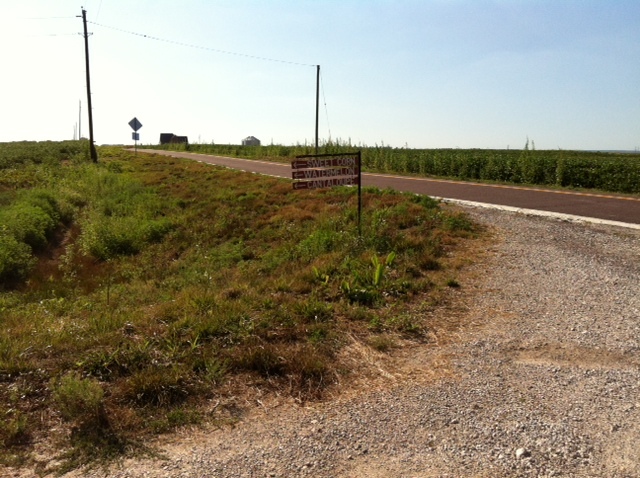 Now that I have made you envious of my locally grown goodness, you may be asking yourself, “Where can I get this prized produce?” Well, take Highway 94 north of St. Charles, get onto Highway H and follow the signs. I hope you enjoy the sweet fruits of summer as much as I have this week. Finally, I’ll ask, what is your favorite locally grown produce?